Pet, child friendly modern home located on bold, native trout stream with sounds from the waterfall and the forests and yet a short distance from Olde Mill Golf Resort and Chateau Morrisette Winery and Restaurants. Sit in front of the fireplace or enjoy breath-taking views and sounds of nature from the expansive deck furnished with tables, chairs, gas grill and a hot tub for six. This 3900 square-foot home sleeps up to fourteen comfortably and appeals to all year round including fishermen, hunters, snow skiers, golfers, couples retreats, just friends and family hanging out, fans traveling to Martinsville Speedway, Floyd Fest or Virginia Tech . Located near New River in Blue Ridge Mountains of Virginia it is a short distance from the Blue Ridge Parkway at Meadows of Dan or Fancy Gap. Great area for four wheeling and hicking. are available on site. Golf, swimming, boating, antiquing, wineries and horseback riding are all within a few miles. For those that must stay connected, the house has WiFi and Satellite TV and a land line. Events: This is a perfect place for Fall Foliage, NASCAR races in Martinsville and county music in Floyd. Two hours from Boone and other Ski resorts in North Carolina. Not far from Mayberry, NC. and Mt Airy, it is a great base for visiting a host of scenic places. The Labor Day Flea Market in Hillsville every September is the largest in the United States. 287 Winery Road, just off the Blue Ridge Parkway just a few miles from Meadows of Dan. We built this beautiful home as our second home to escape Florida during the summer. However, we decided that rather than leave it empty for much of the year, we would share this unique home and fantastic location with others. So this is our home and not a typical rental home. It is probably the largest upscale property in the rental market in Carroll County Virginia area making it perfect for families and friends, hunters and fishermen gathering for vacations of all types. All counter tops are granite including the baths, all floors are hardwood oak with tile in the bathrooms, all the conveniences of home plus the warmth and ambiance of a log home. The deck is huge and includes a 6 person hot tub and a gas grill. All counter tops are granite. All custom-created cabinets. All floors are oak, tile or stone. There are two wash machines and two dryers in the home. There are two dryers in the home. The garage is oversised and easily fits two large automobiles. Two Large refrigerators and freezers in kitchen plus another downstairs. There are some pantry items such as sugar and flower, coffee and basic spices. There is a table for four in the kitchen, but most guests eat at the main table in the dining room. Nearest Ski Resort is about an hour and a half away. CHILDREN: Children are absolutely welcomed. This is the perfect and safe environment for children and family vacations. Infants and children are not discounted so must be included in your count. They also use bedding and require cleaning after- possibly more than adults. PET POLICY: Pets are accepted with a $50.00 cleaning fee. SMOKING: Smoking is permitted outside on the deck, but not inside the home. Privacy and seclusion is offered. Cabin is in a great location for fishing, hunting or just relaxing by the fireplace watching satellite television. Smoking permitted outside on deck only! Trip Cancellation Insurance is available Copy & paste to Browser. Four college roommates from the 70's met up in Dugspur for a mini-reunion in this lovely, roomy cabin. It IS up in the hills and a bit from the main roads but once we got there we got around OK. The home is spacious with lots of places to congregate or be by yourself. We had one beautiful day during our stay and went shopping in Floyd, Meadows of Dan for the candy store and the historic rustic mill, topped off by a yummy lunch at Chateau Morrisette. The next day was a major rain and wind storm which was perfectly fine as we hunkered down in our very comfortable shelter. The kitchen is spacious and well-stocked with pots, pans, dishes, etc. If coming here you might want to bring ziplocks or foil, etc, which wasn't provided, but it wasn't a problem. George was very attentive when we contacted him about any of our concerns. We recommend it highly. My family really enjoyed being able to get away from the city and avoid the spring break crowds. The cabin was clean, spacious and beautiful. We did lose power one day due to a really bad storm but we made the best of it with the provided oil lanterns and candles and spent the evening playing games with our kids. Thank you for a lovely retreat. Wonderful cabin in the woods. Two families went and enjoyed the space and comfort. We enjoyed exploring close by Meadows of Dan (Nancy’s Candy) and some of the Blue Ridge Parkway and drove a little over 1 1/2 hours to Grayson Highlands another day. The hot tub was a great spot to relax and watch stars. The kids loved being at and around the cabin it was just a great way to get away and have quality time. Some of the appliances have been replaced by less expensive models, but this is more than fine as it would be ridiculous to buy overly expensive appliances for a rental home. Please take care of anywhere you rent even better than you would your own home! Thank you for making our Spring Break so special! We spent 4 days with our 3 grown children and spouses. Everything about the home was exactly as advertised. It is wonderfully designed, very well stocked, and in excellent condition/repair. The hot tub was great and easy to use. The views were superb, especially of the river up and down stream. One huge difference to us with this house is that everything worked, just as advertised. If you travel often, then you know this not always the case with rental homes. This house is perfect when you need something this big. We hope to return many times. The house is beautiful and a wonderful place to relax. We are pleased that you enjoyed out home and found time to relax. Sometimes a remote mountain home is the only way to recuperate. This log home is beautiful and very well appointed. We were down for our son's Spring Break from college. We wanted a peaceful, relaxing week to re-energize. This definitely fit the bill! We spent time hiking the property, taking the pups to the creek, playing games in front of the fire and chilling in the hot tub! It was perfect! It snowed while we were there, which was an added bonus! We didn't want to leave! The owners and property managers were a delight to work with! Hope to go back in the future! Thank you for allowing us to experience this Secluded Paradise!!! We are so pleased you had a wonderful stay. We are constantly doing things to keep the home in great condition. I wish all of our livers were not so hectic so we can only spend a weekend. I even drastically reduced the midweek rates, but most lives are just too busy. Have a wonderful summer. 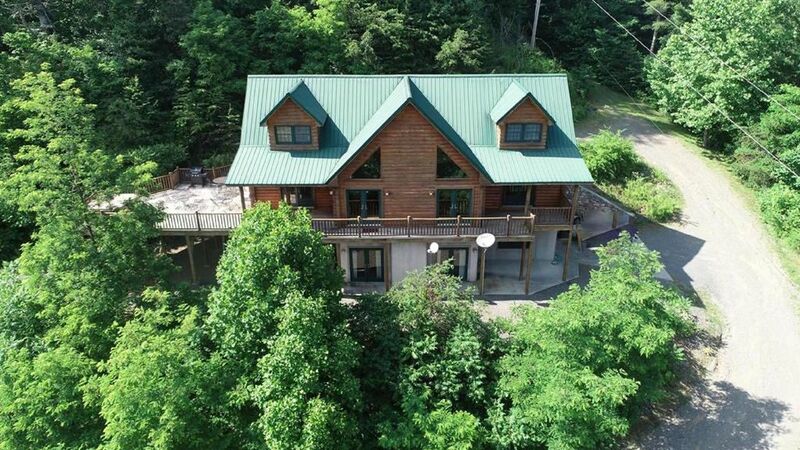 This property is located on 500 feet of frontage at a waterfall on Laural Fork Creek in Laurel Fork, Virginia. It is close to Floyd, Virginia and Mt. Airy, North Carolina and Meadows of Dan on the Blue Ridge Parkway. It is near the junctions of Interstate 77 & Interstate 81 The closest Exit off Interstate 77 is at Hwyay 58 in Hillsville, Virginia. G.L. LOG HOMES/LOTS: We have four 5 acre home sites remaining for sale at the Highlands at Burks Fork. Minimum three night stay Two nights will be considered within two weeks of arrival date; subject to availability. A $150 house cleaning fee will apply for two night stays once confirmed. Please email owner for availability and confirmation. Infants are considered people so are counted. They create as much cleaning and garbage (diapers, etc.) as adults. So infants are counted in the total number of guests. Trip Cancellation Insurance is available We recognize that numbers increase and decrease between the time the reservation is made and arrival. Please provide any change in the number of guests so that we can adjust your invoice.